They came reliably like clockwork each year. More reliable than holiday decorations and definitely more reliable than the weather. They always came in big white boxes. Packed tight. We couldn’t wait to have the first ones with milk or later hot steaming coffee. Yay for Auntie’s Spritz Cookies! Dip them in and enjoy! If you are anything like me you are obsessed with homemade sweets. But cutting cookies is not exactly my idea of fun. Of course, cut cookies look so cute and you can create amazing ones with a bit of deco. But rolling out cookie dough got even more annoying with an impatient little girl who wants to help. You know. The toddler kind of help. Spritz Cookies on the other hand… They can look so cute! Depending on what you use to make or decorate them they can turn out pretty fancy and a great gift from the kitchen. Even if you only have a piping bag with star tip they look amazing. They are robust, too, so you can use them in a long-distance Christmas cookie exchange or cookie care packages! Read about 45 more delicious recipes for cookies that ship well here. 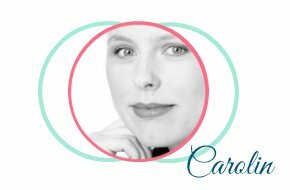 Includes packing tips! 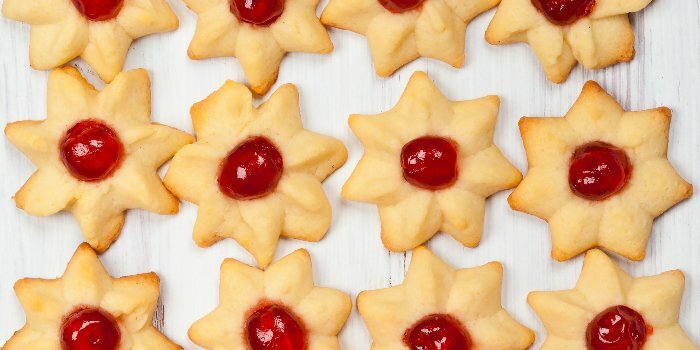 If you have a nice basic recipe for Spritz cookies you can create dozens of heavenly variations. Use candied cherries, chopped nuts or caramel, dip them in melted chocolate, glaze them with sugar frosting, decorate with sprinkles, or glue them together with Nutella or jam. One of my favorite variations is Spritz cookies with maple syrup and chopped walnuts. With one large bowl of Spritz cookie dough you can create all the holiday cookies you want. 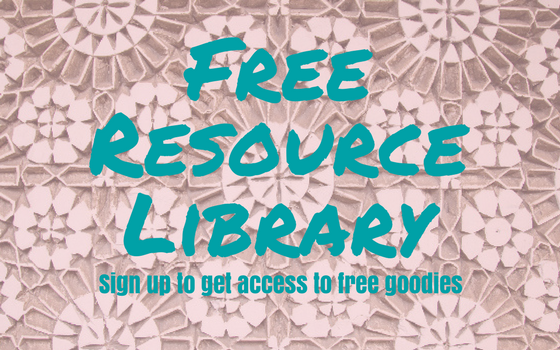 Enjoy them at home, store them away, freeze some, or send a cookie care package. Obviously, they are typical German cookies, says Wikipedia. To me, they might not be the typical German christmas cookie though the big white boxes always come at the beginning of the holiday season. 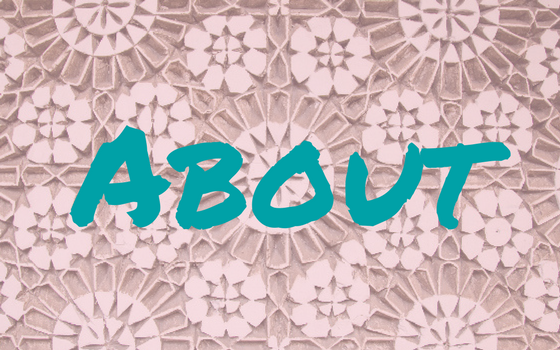 In my home, we always made decorated sugar cookies and coconut macaroons, so those are the typical German Christmas cookies to me. 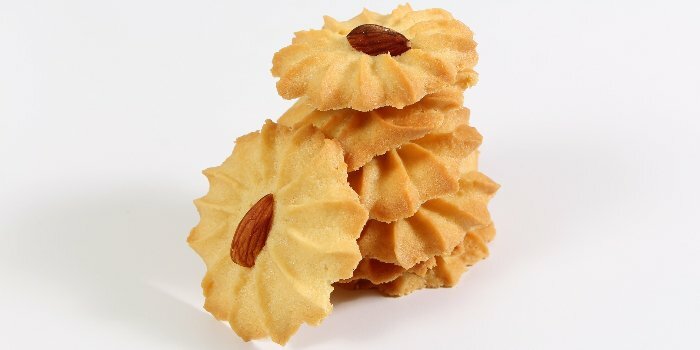 At least I can say that I never saw spritz cookies in Morocco. So, they may be German cookies after all. But as I found for Moroccan Baghrir pancakes, Wikipedia is not entirely right! For Spritzgebäck it says that parents in Germany usually spent a week or two baking in the afternoon with their children. Ha! Who in the world has time for that?? And what do you do with that amount of cookies?? When I was young, we had one cookie baking day. Many of my friends also had a Christmas cookie baking day with their family. Today, we don’t do it any longer. But there is a cookie baking afternoon in my daughter’s playschool each year. 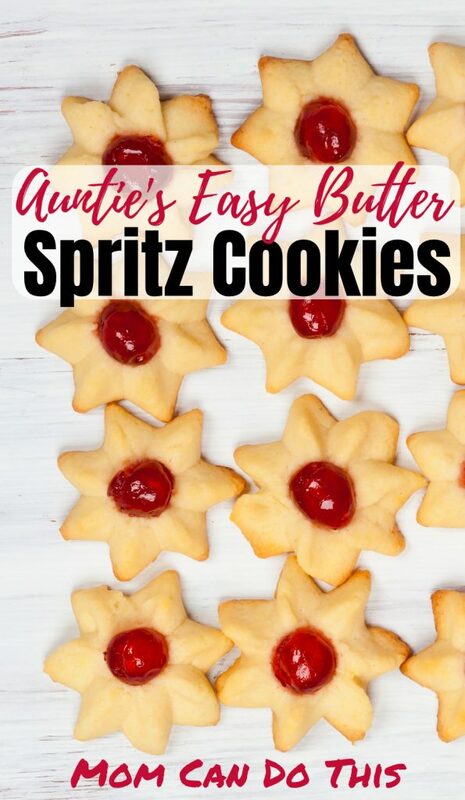 I share with you a basic recipe for buttery spritz cookies. Take it and make it your own best spritz cookie recipe. For great results, the dough needs to have just the right texture, not too hard, not too soft or sticky. The easiest way to make them is using a piping bag with large star tip. 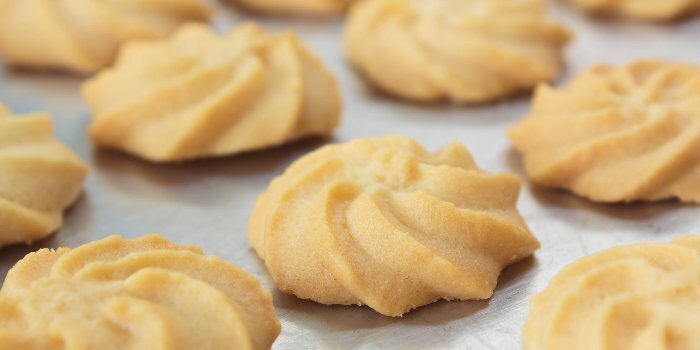 Yes, you can totally make spritz cookies without a cookie press. But if you have a meat grinder with cookie plate, that works well, fast and easy. In that case, the dough needs to be a little harder. Cool it down before using or use a little less milk. A heavy old-fashioned meat grinder is what auntie uses. If you use a cookie press, like I do, the dough has to be of softer consistency. Add a little bit of milk if you can’t press it through easily. I use my cookie press with different caps. I press the dough directly onto an enamel cookie sheet pan. You can use a normal greased cookie sheet, too. With the cookie press I use, it takes 3 pushes of the button for one cookie. But this depends on how big you want your cookies. Use all ingredients at room temperature. Leave out the milk if you use a meat grinder. Mix thouroughly and put the cookie dough into the fridge for one hour. Make sure it is packed air-tight to not take on any weird fridge flavors. Take the spritz cookie dough out of the fridge. Knead it and let it sit at room temperature for 15 minutes. Run it throught the meat grinder to make spritz cookies. Or fill it into a piping bag or cookie press and make some test cookies. Do they “spritz” /squeeze well? No? Add a little bit of milk to make the spritz cookie dough softer and try again. Preheat the oven to 180°C/°F. 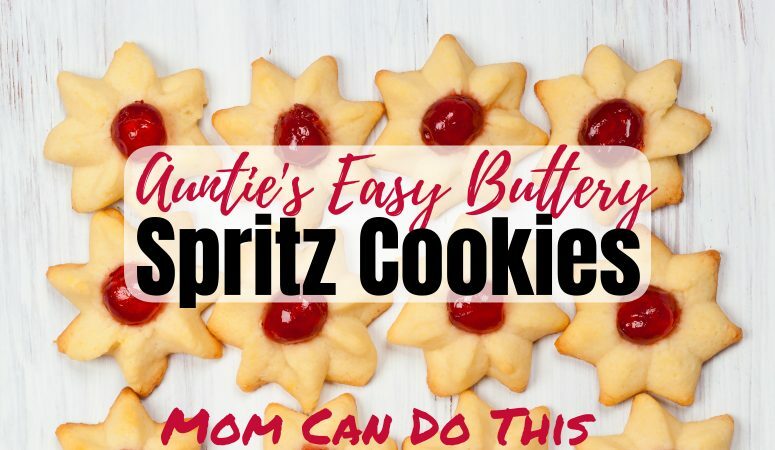 Bake the spritz cookies for 10 – 15 minutes. 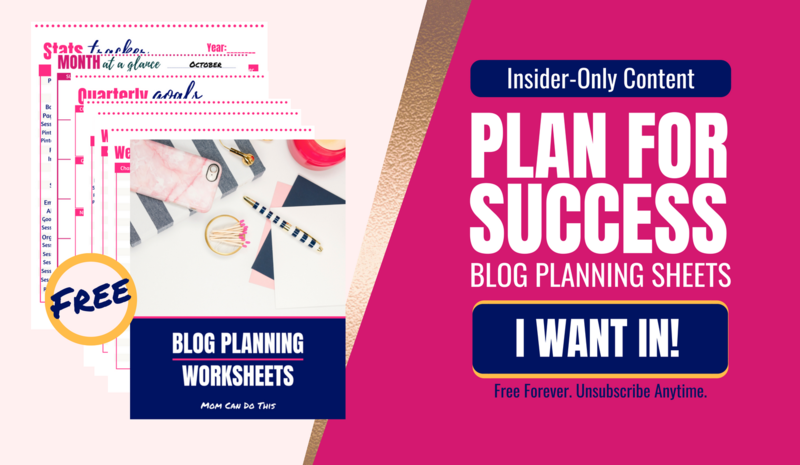 Do you have a blog and want to share printable recipes? 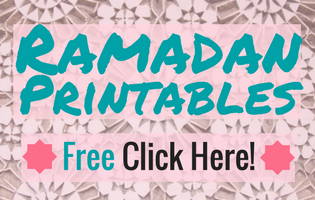 Learn how to offer recipe printables on your blog with a free WordPress plugin in this post! Use all ingredients at room temperature. Leave out the milk if you use a meat grinder. Mix thouroughly and put the cookie dough into the fridge for one hour. Make sure it is packed air-tight to not take on any weird fridge flavors. Take the spritz cookie dough out of the fridge. Knead it and let it sit at room temperature for 15 minutes. Run it throught the meat grinder to make spritz cookies. OR fill it into a piping bag or cookie press and make some test cookies. If necessary, add a little bit of milk to make the spritz cookie dough softer. Preheat the oven to 180°C/°F. 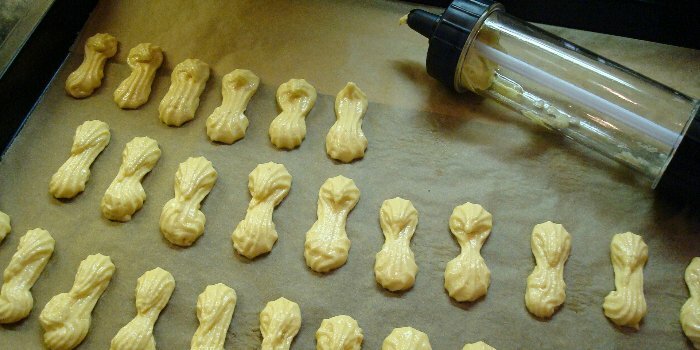 Bake the spritz cookies for 10 - 15 minutes. 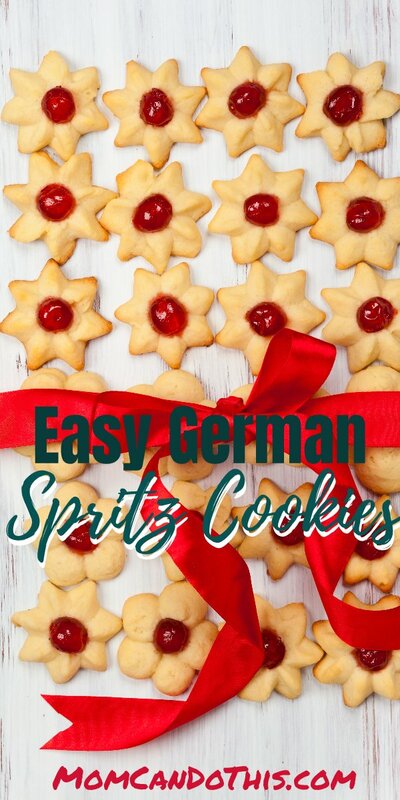 Please, pin this spritz cookie recipe for others to enjoy homemade German Christmas cookies!